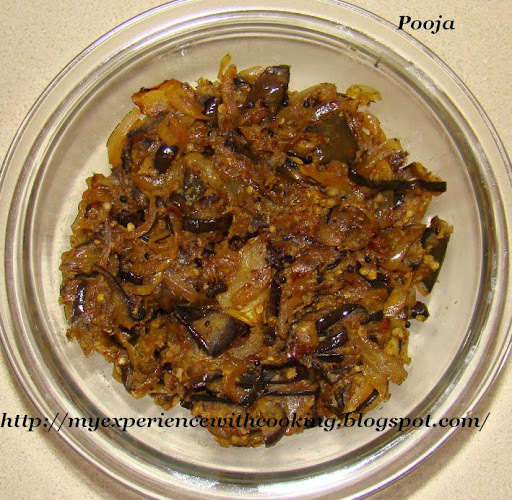 'Brinjal Mezhukkupuratti'(Eggplant Fry) is another side dish we have with rice. I love to have brinjals when they are deep fried because deep frying brinjals removes the slight bitter taste and the salt marination allows it to absorb less oil. Being health conscious I do not usually make fried foods at home. But at times when I do not feel guilty of deep frying I prepare this dish by deep frying brinjals rather than my usual way of stir fry. Also I prefer small sized brinjals rather than the big ones as they are more tastier. This recipe is a mix of 'thoran'(that is made with coconut) and mezhukkupuratti(stir fry made without coconut). The brinjal pieces are first marinated and kept for a few minutes. The marinated brinjals are then deep fried in oil and later sauteed with onions and ground coconut mixture. This goes well with steamed rice as well as other Indian breads like Chapati and Roti. Cut each brinjal into round, thin pieces. Marinate with chilly powder, turmeric powder, pepper powder and salt. Keep aside for about 10 minutes. Deep fry in oil until it turns light brown. Drain excess oil on paper towels and keep aside. Grind coconut with cumin seeds and garlic adding water till it becomes a paste. Heat 1 tsp oil in a pan at medium heat and splutter mustard seeds. Add curry leaves and red chilly and saute for few seconds. Add sliced onion and cook till it turns brown. Add enough salt and add the ground mixture. Saute till raw smell goes. Add the fried brinjal slices, mix well and cook for a few minutes before turning off heat.